#257851 signatures needed to reach goal of 1000000 ~ PLEASE SIGN! Signed. 829,740 signatures and mounting literally by the second. There is no place in the 21st century for this vile hatred! signed. Thank you for sharing. "1,184,678 have signed. Let’s get to 1,500,000!" The petition should have been addressed to Scott Ryan the Senate president. 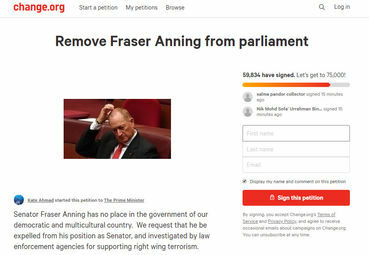 He would be in the position to call Anning to task. The PM , to whom the petition is initially addressed, has neither the power nor authority to sack senators. Anning used a clever ruse to get into parliament and is not very popular, He will be standing as an independent at the next election and most probably will not be reelected. i posted your comment on the petition Walter, thank you for pointing that out!!! Signed with pleasure! This man is an embarrassment to Australia. By the same token, why don't we start a petition to remove Ilhan Omar and Rachida Tlaib? The Australian Greens have said they will try to suspend Senator Anning from parliament until the election. - only 2 sitting days left anyway before the election and as Walter has said he is not popular and probably will not be re-elected. Just reported - A LNP senator James McGrath has "rebuked the Greens’ push to suspend Queensland senator Fraser Anning from parliament, declaring no politician should be booted from the people’s house for comments made outside of the chamber". Thanks Animae. Yes i watched them do it Elizabeth! And Anning's response on Twitter? I stand by my comments on Muslim immigration. Despite all the left wing hysteria today, no one actually argued against what I said, because it is 100% true. Countries that had increased Muslim immigration had increased crime and terrorism. Sweden, Germany, UK, France etc." Spreading his vile racist hatred as usual!!! !